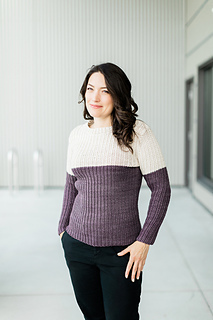 Rich texture in the simplest of stitches makes this easy pullover a must for any project list. Add in the supreme squish factor and luxe softness and your fall wardrobe is one sweater better. This pullover is worked flat in pieces and then seamed. If desired, it can be worked in one colour by ignoring the colour change instructions. This pattern uses up every inch of yarn. If gauge changes even by half a stitch, an extra skein will be needed. Intended to be worn with 0” / 0 cm ease. 4 (4, 5, 6, 6, 7, 7) skeins SweetGeorgia Yarns Superwash Worsted in Mink (MC) (200 yd / 183 m total per 4 oz / 115 g; 100% Superwash Merino). 2 (2, 3, 3, 3, 3, 3) skeins SweetGeorgia Yarns Superwash Worsted in Linen (CC) (200 yd / 183 m total per 4 oz / 115 g; 100% Superwash Merino). 20 sts and 31 rows = 4” / 10 cm in Broken Rib, blocked.